Every defense professional needs a Multicam medium ruck where you can store your necessities. , For years, rucks continue to prove to be a worthy asset which will be very useful for the whole of your travelling life and it will be the best choice in tactical operations. The Multicam medium rucksack really grabs the trust of many with its combination of style, durability, and comfort. The suitable size of the main compartment along with its outer pockets help in carrying various defense and tactical equipment. It is light-weight and very tough, it has also got added straps (molle) for attaching other stuff. The Multicam medium ruck is applauded and appreciated for its toughness and it has this quality because it is made up of 100% pure quality Cordura Nylon. This Medium ruck Multicam has a dimension of 21.6x16x6 inches and it has got a total volume of a 3000-inch cube. The main eye-catching feature is the issued Genuine RFI. The sack is very comfortable for the soldiers in terms of carrying it in the rough environment with as many items as we wish to carry with us. The sack is reputed as the famous Molle pack because of the brilliance of Molle facility as it has got on the sides and on the rear side with extra tough straps where additional items or extra small bags can be hooked up. Thus the soldiers can add up their valuable ammo and other stuff in small pouches to this Molle straps. This Medium Ruck Multicam is mainly designed from the POV of defense use. 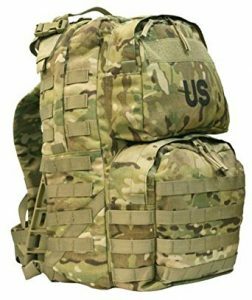 This Multicam medium rucksack is synonymously known as Army rucksack proving its true potential for loading defense equipment. Reading the Multicam medium ruck review, the armies who involve in defense operations will find this sack catchy from the aspect of its utility and mainly from its Molle feature. It is a very smart and handy Molle pack for each one of us. The Molle feature makes the Multicam medium ruck positive in terms of carrying and attaching additional valuables. It is the Multicam with Operational Camouflage Pattern (OCP) or (OEFCP) which fills the soldiers’ criteria of dressing and gives a relief from being tracked by enemies. Hence, this Multicam medium rucksack is very powerful in defense operations. This Medium ruck Multicam has a main compartment which is zipped with locking facility. In the front of the main compartment, it has got two other pockets. The side pockets are even useful with additional straps. These straps act as an extra hanging site of the Multicam medium ruck. The Multicam medium rucksack has the most valuable frame which is composite where we can use it as the armor plates of the body which can be easily supported on our back.The compartments and pockets are well spacious so that, it can be used in long journeys or defense operations. With its impressive quality, the makers have kept the utmost requirement of its extreme durability. For carrying water bottles the mortar pockets are very effective. The stitch is of extreme quality and the nylon material adds up to its strength. The bag can easily hold 50 to 70 lbs tactical and defense gears. Q:How much weight can it carry? A: It can easily carry up to 70 pounds. Q: Does it hold a compartment for water bottles? A: No water bottle storage pocket is there. But bottles can be kept in mortar pockets. Q: Does it has the Molle feature? A: Yes, additional straps are there to hold additional items. Q: If plate carrier is removed, would it be hard to carry? A: No, it can be easily used. Q: Can it hold laptops? A: Though it’s not a laptop carrier, it can hold laptop based on the size. Q: What is the dimension in length, breadth, and height? A: It is 21.6x16x6 inches. A: OCP is operational camouflage pattern. Q: Can we get an extra frame? A: An extra frame is already added. Q: How many compartments are there? A: There is a main compartment with two other compartments on the top. Q: Does this bag has padded shoulder straps? Q: Can this rucksack be used on a regular basis? A: It is generally for defense operations, but apart from the frame, it can be used. Q: Is the stitch and cloth material of good quality? A: The material is nylon of immense supreme quality. Q: Do the zips have locks? A: The zips have a strip attached to it, with a small lock. Q: Are the Molle straps good? A: The molle straps are very tough. This rucksack is made with strength and style. Its organized mode along with its toughness and durability, as it can be used in rough military operations and other field and personal works. The military features of OCP, Molle, light-weight, nylon strength and many other tactical features will become quite useful during your field operations.